Venous Insufficiency Symptoms – What Are They? When suffering from leg veins problems such as varicose veins or blood clots, there is greater potential for chronic venous insufficiency. Our veins are the vessels which return blood from our limbs back to the heart. When that blood flow is compromised, venous insufficiency is diagnosed. 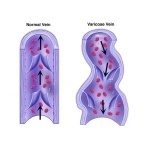 There are many causes for venous insufficiency which include enlarged veins. Another cause is the weakness of the muscles which assist in initiating the blood to flow sufficiently. When there is not a continuous flowing of blood from the legs and arms back to the heart, venous insufficiency symptoms are sure to begin.